Tomorrow is the day before lent, for those who celebrate it, and to the rest of us, either "fat Tuesday," "shrove Tuesday," or in Hamtramck, "paczki day." Historically, paczki day started as a way to use and rid the house of every ounce of lard, sugar, eggs, and fruit, all forbidden for consumption during lent. The end result is fried dough containing a normal human being's entire caloric intake for the day. The historical premise may have faded, but the paczki a great excuse, especially for over sized mid-westerners, to eat an inordinate amount of calories, carbohydrates, sugar, and eggs, all packed into one mouth watering treat. 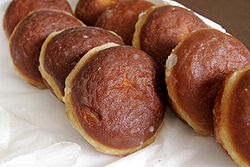 A Paczki, for those who dont' know, is a deep fried piece of dough, which is flattened into a sphere shape, filled with fruit preserves, and covered with icing and powdered sugar. These polish treats have been around forever, but became a phenomenon over the past century once metro Detroiters' outside of Hamtramck got a taste for them and realized that they had no self control. Recently though, Kroger, and other local groceries picked up on Metro Detroiters' taste for sugar and lard, and paczkis can now be found year round, albeit without the charm of eating one after standing in line at a Hamtramck Bakery on that infamous Tuesday. Probably more relevant is that the inherent thought process behind creating these caloric monsters (using any/all unhealthy ingredients left in the kitchen and combining them into one food item) should be a pretty good indication that paczkis should probably only be eaten once a year. Paczki day still holds a special place in the hearts of Metro Detroiters, and this year is no different. Three years ago, the City of Hamtramck decided to create a "Countdown to Paczki Day," held on the Saturday before paczki day. The Detroit Free Press recently quoted Hamtramck's Mayor, Karen Majewski, as stating, "This event is all about getting families in the spirit of Paczki day," which by my accounts refers to the spirit of people overindulging with complete disregard for physical health and societal norms. Awesome. This year the countdown event contained a covered tent with about nine different bakeries offering free paczkis, polish music, the chance to learn the polka, and rides on the "Paczki Express," bus, giving patrons a glimpse of the plethora of bakeries selling the fried delight. Families of many ethnicities poured into the tent on Joseph Campau and Holbrook, thumbing their noses at frigid temperatures, and extreme snow, not to mention the 500 calories (low ball estimate) each paczki approximately contains. Organizers of the event say that festivities will be scheduled throughout Tuesday as well, including performances by Hamtramck local bands the Polish Muslims, the Kielbasa Kings, and Polka Floyd, among others at various Hamtramck bars throughout the day. (see schedule here). Furthermore, Hamtramck bars and bakeries will celebrate the holiday with bar crawls, giveaways, and Polish food and drink. While Saturday's event has already passed, Tuesday is still upcoming. If you don't have work or are able to take a couple hours off to fatten yourself up, take a trip to Ham Town and enjoy yourself. Bring some paczkis back to the office and all will be forgiven. The Hamtramck Star published a poll a few years back asking readers which bakery was their favorite for paczkis. You can find the list below. Note: Although it has not not aired yet, Family Donut Shop was featured by Tony Bourdain when he was in town filming an episode of "No Reservations" last month.